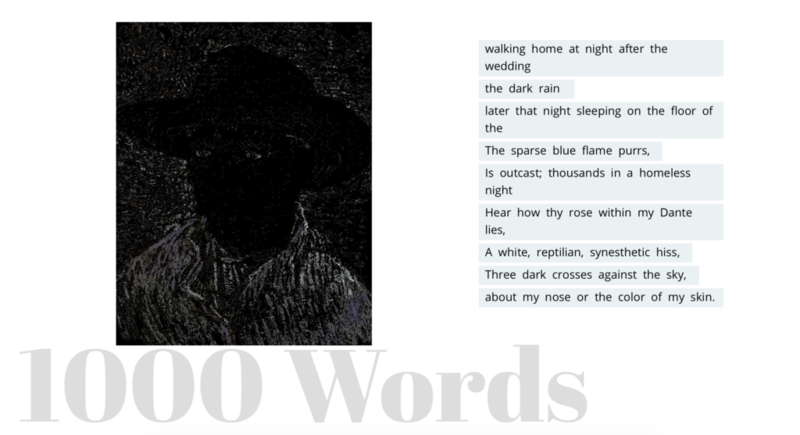 Lab member Fedor Karmanov has created a beautiful new project that combines machine vision, machine learning, and poetry. 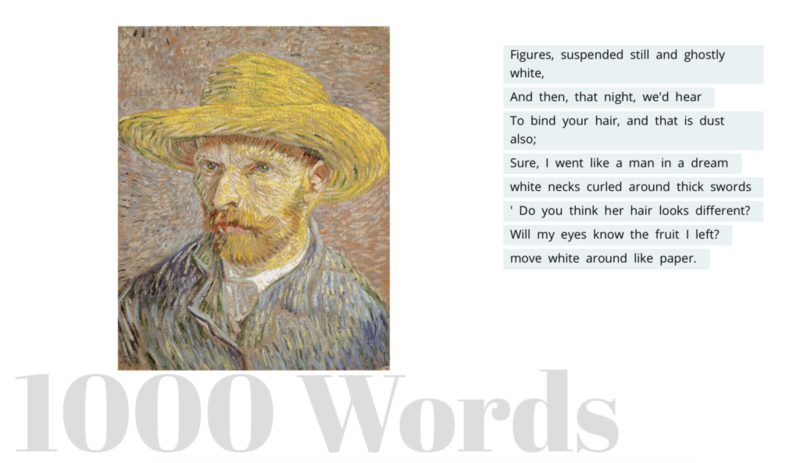 It is called “1,000 Words,” and takes the self-portraits of Van Gogh and generates poems based on the colours and items in the portrait. The poems consist of 10 lines randomly drawn from an archive of about 70,000 twentieth-century poems. As we ask in the introduction to the piece: “Would this process of machines learning to see also help us as human beings see differently, and think about seeing differently?” It’s an example of the more creative use of algorithms, something that is equally important to our lab. While we often focus on the analytical functions of algorithms (identifying things like gender bias in book reviews, prestige bias in academic publishing, or nostalgia bias in prizewinning literature), it is important to think about the ways in which machines change our understanding of language, and, in this case, vision. These kinds of projects can tap into a the chance encounter with words, but also the curiosity of how machines focus on an image. It is all part of a much bigger effort to better understand how we think with machines, rather than have them think for us.